Jakarta Governor, Anies Baswedan wants odd-even system traffic engineering in several Jakarta roads for Asian Games preparation to be monitored continuously. Odd-even traffic engineering implementation starts this Monday (7/2) until July 30.
" 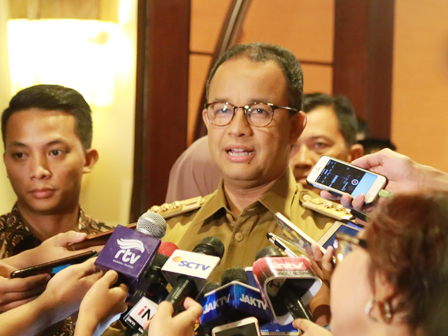 I want all teams to be prepared on the field to monitor this odd-even system traffic engineering"
"I want all teams to be prepared on the field to monitor this odd-even system traffic engineering," he stated at Borobudur Hotel, Central Jakarta, Monday (7/2). He explained, road users will be offered several alternative routes via Jl. Warung Jati Barat, Jl. Pejaten Raya, Jl. Pasar Minggu, Jl. Soepomo and Jl. Saharjo. "I want to emphasize that traffic engineering is done in order to succeed Indonesia as the Asian Games host," he affirmed. He also hopes all residents to see this policy as a way to give best facilitates for Asian Games guests, athletes, journalists, and officials from the world. "As a host it is certain to have an extra work thus cooperation from all sides are needed to succeed this event," he conveyed.